While recently browsing Oklahoma City’s cozy literary haven Full Circle Books, I noticed several bird guides next to the cash register. I flipped through one of these beautifully illustrated volumes, and considered buying it, but then I began to question its usefulness to me. I’m an incidental bird watcher. I don’t go looking for them, but when I see one, I’m likely to admire it. But even when I stop to look at birds in my midst, my nearsightedness usually gets the better of me. One time I marveled at what I thought was a little turkey wandering around downtown. Upon closer inspection, I found that it was in fact a pigeon dangling a piece of garbage from its beak. Nature’s spell was broken. So, while I usually can’t identify the birds I see and I can’t see them that well, I do have some favorites. 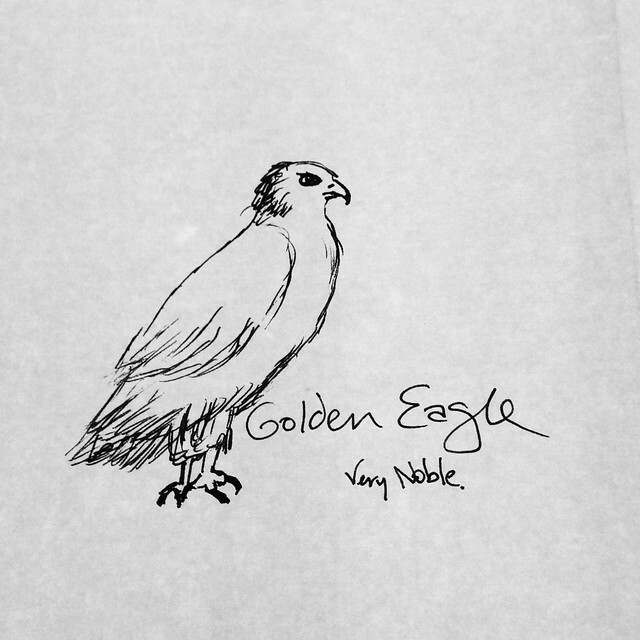 Inspired by the bird guides I didn’t buy, I decided to sketch a few of them and explain their appeal. Watch out, John James Audubon. 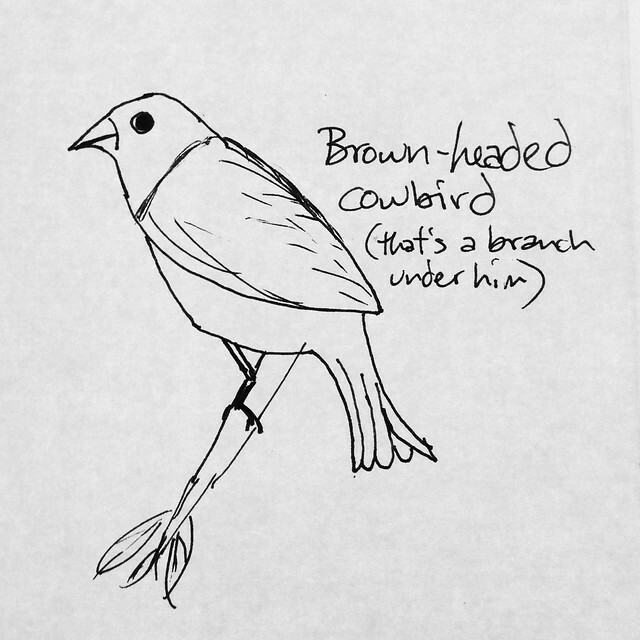 One of my favorite Oklahoma birds is the brown-headed cowbird, precisely because of the incredible sounds it makes. They have song that’s hard to describe—it doesn’t sound like a noise that could be made by a living organism. It’s a little like a synthesized babbling brook. Listen to it here. Cowbirds are known as brood parasites, because they lay their eggs in other birds’ nests, leaving their hapless victims to raise their young. This resourceful strategy saves the cowbird from the inconveniences of parenting and nest building. You can find these blackbirds (distinguishable by their brown heads) in or near wide-open areas all year in Oklahoma. The snowy owl is a fairly rare sight in Oklahoma, but the arctic birds sometimes ventures this far south in the winter. 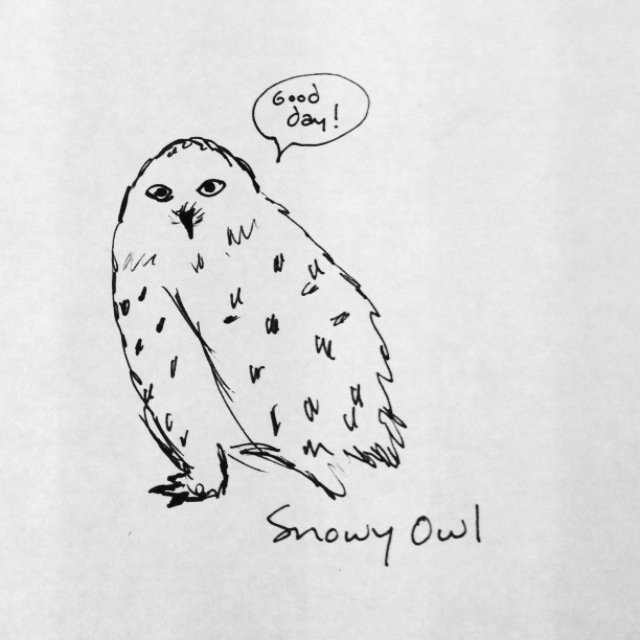 Harry Potter’s owl—Hedwig—is a snowy owl. They’re named for their white feathers, which are typically spotted with darker markings. Fun fact: This stout bird is the heaviest owl in North America. If you do see them here, they’ll probably be perched high up, surveying pastures and fields for prey. 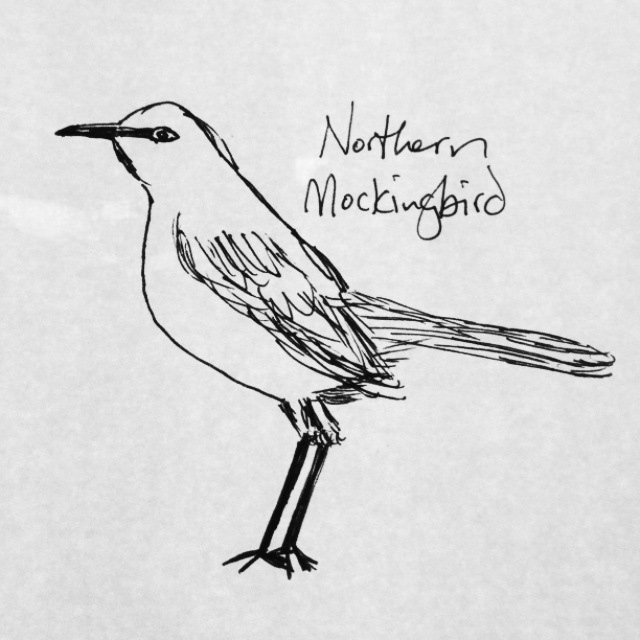 Mockingbirds are bold. I have watched them on numerous occasions dive bomb and otherwise harass my cats, who threaten their nests. They squawk and flap their wings menacingly, and usually succeed in scaring whatever they’re attacking. You’ve got to respect their pluck. Mockingbirds seem to travel in packs. I often encounter dozens of them loudly singing in trees around my house. Like cowbirds, you can find them all year in Oklahoma. 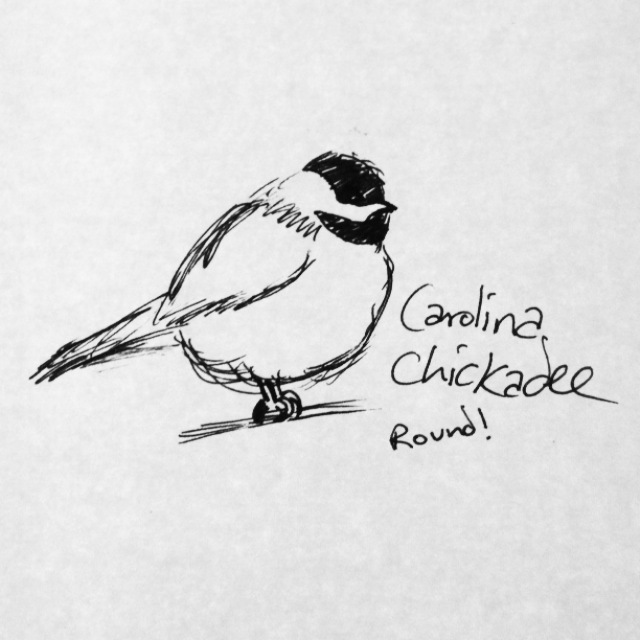 The Cornell Lab of Ornithology says Carolina chickadees are intelligent and curious, but I love them simply because they’re cute and fat. The graduated washes of color on Cedar waxwings remind me of painted silk. These beautiful birds are named for red, wax-like secretions on their wings and their fondness for red cedar berries. In fact, berries and fruits of all kinds are their foods of choice. 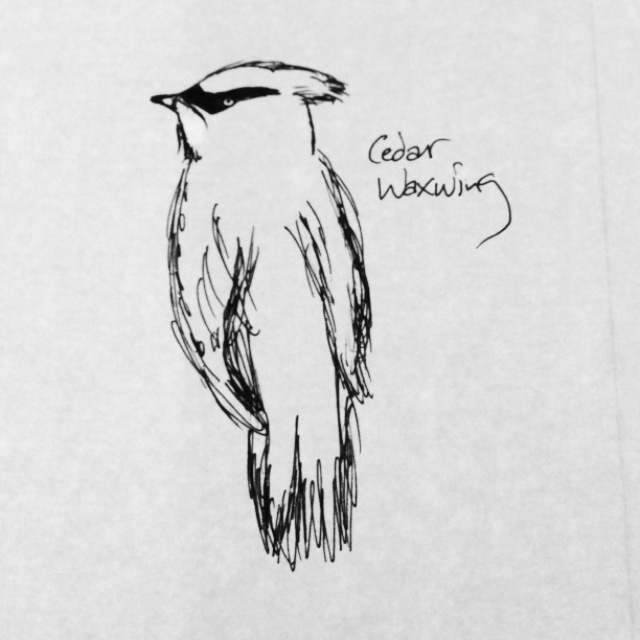 There have been cases of cedar waxwings getting drunk and even overdosing on large quantities of fermented fruit. Cedar waxwings are most often found in Oklahoma during the winter. Whether you watch the birds in your backyard or pursue them at Oklahoma’s many birding sites, there’s no denying the appeal of these feathered flockers. The following websites offer a lots of information about them.